Technology can very complex. Like every profession, technologists use lots of acronyms and jargon. As digital executives, we may succumb to the temptation to get overly complex. That is natural because much of what we do is complex. So, after coming up with ideas, we need to develop simple messages and language to test our ideas with folks from the business. 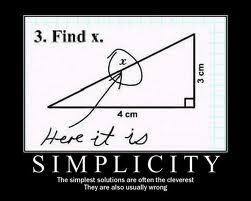 Second, simplicity increases the chances that the business audience will understand the intent and see the benefits. Does the average marketing person understand what people in technology are saying? If not, we need to go back to the drawing board. There is way too much complexity in the world. As digital executives, we can drive to simplicity that benefits everyone.